We are partnering with Rusty Bucket Mushrooms, owned and run by Van Scholten and Peter Johnson. Both Pete and Van worked on our farm previously, before beginning their own mushroom farming adventure. Their mushrooms share will run for 21 weeks just like our CSA, and pickups will be at our farm on either Tuesdays or Thursdays, from 3:30-6:30 p.m. 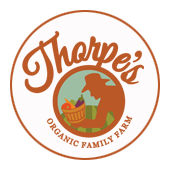 Anyone may join their mushroom CSA, with or without a Thorpe's CSA membership! Please click here to learn more about this exciting share option! Any questions regarding the mushroom share may be directed to rustybucketmushrooms@gmail.com.